Summon: Give Sheepish Dunmer Cover. 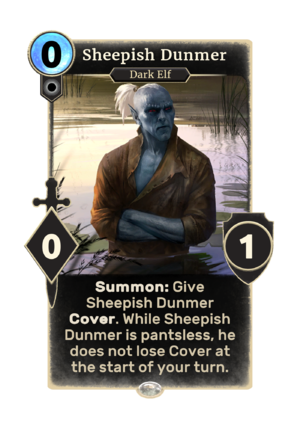 While Sheepish Dunmer is pantsless, he does not lose Cover at the start of your turn. Sheepish Dunmer is a Neutral creature card. The card cannot be obtained as part of your collection, but it is created by Stolen Pants. "I could use a little help here." "I am a mostly clothed warrior..."
This card depicts Hentus Yansurnummu from Morrowind, whose pants were stolen in the quest Hentus Needs Pants. This page was last modified on 27 February 2019, at 23:56.